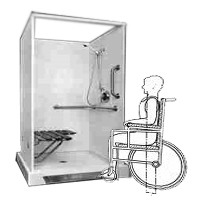 Roll In Showers create a handicap accessible showering environment for anyone needing the use of a wheelchair or has trouble getting over the shower curb. Handicap roll in showers are a great safety feature for anyone with limited mobility. Roll in showers allow easy access to the shower and offer a safe bathing alternative to traditional barrier showers. With roll in showers, the floor of the shower is made level with the bathroom floor. Thus, it is easy to step into the shower without having to tackle a dangerous barrier curb that can be difficult to maneuver. A wheelchair can also easily be rolled into the shower. With the barrier free, low profile design, of a roll in shower, caregivers can easily help with bathing. There are many benefits to handicap roll in showers. Increased independence is one of the most important benefits associated with a roll in shower. There are many alternatives to roll in showers, including tub transfer seats, shower stools, shower chairs and sliding transfer benches. However, these alternatives still require a considerable range of motion and getting into and out of the shower or tub can still be a challenge. Handicap roll in showers, on the other hand, offer unsurpassed accessibility and safety, allowing easy entry and exit from the shower. Handicap roll in showers improve hygiene options for individuals of all ages with limited mobility, increasing independence and making bathing safe. The cost of purchasing and installing handicap roll in showers depends on a number of factors. In many cases, a roll in shower can be designed to fit within an existing bathroom layout. The shower stalls are easily “glued” into place and becomes a permanent fixture to your bathroom area. Make sure to obtain the proper dimensions and where the drainage flows, before making an order. The standard color for roll in showers is white made out of a fiberglass material that can be easily installed. There are also roll in barrier free showers that are beautifully tiled with a rainbow assortment of colors ranging from light blues to greens. Collapsible rubber water retainers can be fitted near the roll in showers so water does not flow pass the intended showering areas. Popular options include recessed wall roll in showers, corner roll in showers, and bathtub replacement roll in showers. A recessed wall shower can start at under $800 plus installation fees, bathtub replacement roll in showers start around $1,300 and corner roll in showers start around $1,500. Some medical insurance may cover some of the cost of purchasing and installing a roll in shower. Get more information about handicap showers and their installation times.